The development of a technology for measuring the magnetic properties of materials when force (stress) is applied has Fujitsu Laboratories. This will be vital to enabling more advanced large-scale simulations of the kinds of magnetic fields found in the motors of Electric Vehicles (EV). EV engines, which have numerous operating conditions, such as their rotational speed, need to be prototyped and tested repeatedly under these different conditions. Computer simulations could help make the design process more efficient and increase motor performance, but the simulations need to be able to accurately model energy losses arising from the magnetic fields of different materials, which can change considerably when stress is applied. This creates a need for a technology that can accurately measure the effects of stress. By attaching a piezoelectric device to an electromagnetic steel test plate to create various states of stress, Fujitsu Laboratories has developed a technology that measures the magnetic property called vector magnetic hysteresis - which reduces motor efficiency - in the presence of stress. Fujitsu will be able to use this technology to obtain a wide variety of measurement data that are vital to the large-scale, multi-scale magnetic-field simulator that it is currently developing. This technology promises to promote the design of high-efficiency electric motors with low energy loss, and the development of material informatics, which is the development of materials with computer simulations. Details of this technology were presented at the Institute of Electrical Engineers of Japan's Joint Meeting on Magnetics & Linear Drive on 5th December in Nagasaki, Japan. Motors are said to account for some 40-50% of worldwide electric-power consumption. When motors are running, energy loss occurs due to the properties that the motor's constituent materials exhibit in relation to magnetism; improving the efficiency of all the electric motors in Japan by 1%, for example, would result in energy savings equivalent to the energy produced by one thermal-generation power plant. In addition, not only from an environmental perspective, but as electric motor-driven EV become more prevalent, there is a growing demand for technologies that can improve motor efficiency. EV engines, which have numerous operating conditions, such as their rotational speed, need to be prototyped and tested repeatedly under these different conditions. Computer simulations could help make the design process more efficient and increase motor performance. The materials used in electric motors undergo a process in manufacturing called shrink-fitting, in which they are joined using heat and force; this process creates stress inside the material that persists. Simulations need to be able to accurately model the energy loss arising from the magnetic properties of a material, but it is known that those magnetic properties can change significantly when stress is applied, so there is a need to be able to accurately measure the effects of stress. But because existing measuring devices for applying stress are large - about one meter square - and perform measurements on a large scale, a more compact and convenient measurement device that could gather a wide range of data more easily would be desirable. Fujitsu Laboratories has developed a technology that measures a magnetic property called vector magnetic hysteresis, using a piezoelectric device with a shape that can change with the application of voltage and that can produce force in a specific direction to flexibly control the stress on the material being measured (see Figures 1, 2, 3). With this technology, a piezoelectric device - which changes form when voltage is applied - is attached to the test material being measured, and by controlling the voltage applied to the piezoelectric device, the magnetic properties are measured while modulating the stress applied to the test material plate. By attaching the piezoelectric device to the test material being measured using an adhesive, direct stress is applied to the area being measured. Because the test-material plate is a thin sheet, piezoelectric devices can be mounted to both sides, and by applying an equal stress to both sides, the test material's warpage can be controlled. In this way, stress is applied uniformly and with fine control based on voltages to the entire area being measured. The common motor, known as an induction motor, can generate an internal electric field. Fujitsu Laboratories developed a Round Rotational Single Sheet Tester (RRSST) that measures vector magnetic hysteresis using a common, compact induction motor. The instrument has a simple structure and is small, measuring 30cm square. 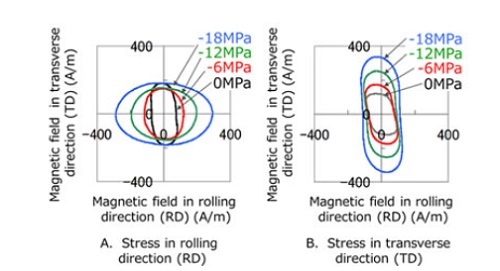 By incorporating a structure in which it was possible to apply stress to the test materials and equipping it to the measuring instrument, Fujitsu Laboratories was able to easily measure vector magnetic hysteresis under a variety of stress conditions. This marks the world's first time that it was possible to measure vector magnetic hysteresis of stress conditions applied by a piezoelectric device. This technology was developed in collaboration with Professor Tetsuji Matsuo of Kyoto University. This newly developed technology is capable of obtaining a variety of measurements needed to implement accurate magnetic-field simulations that account for stress applied to materials. Implementing accurate magnetic-field simulations promises to greatly accelerate the development process of EV motors, and, for example, to reduce the number of prototypes - each of which incur high costs and a great many man hours - needed to develop such equipment, from the current figure of around five to only one or two. Fujitsu is developing FUJITSU Manufacturing Industry Solution EXAMAG LLG Simulator, magnetic-field simulation software package that uses massively parallel computation, and is currently working on next-generation magnetic-field simulations that can model the vector magnetic hysteresis properties of magnetic materials. Fujitsu Laboratories plans to continue refining the capabilities for measuring vector magnetic hysteresis and will move forward on work on gathering different kinds of measurements, with the goal of incorporating the benefits of this technology into the next version of EXAMAG LLG Simulator being developed at Fujitsu and due out in 2018. This technology also promises to advance material informatics, which uses computer simulations in material development, and promises to contribute to less wasted energy as more efficient motors gain widespread adoption.